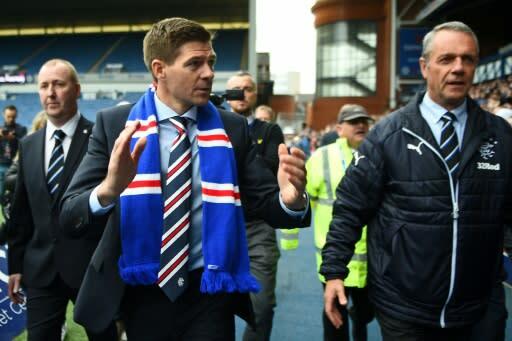 Former Liverpool icon Steven Gerrard complimented his Rangers players in delivering him his first victory as manager in the Scottish Premiership but warned them to improve their discipline following the 2-0 win over St Mirren on Sunday. Gerrard's side had shown great resolve to take the three points as Ross McCrorie got a straight red card just after the half hour mark for a professional foul on Nicolai Brock-Madsen. However, they were already 2-0 up when McCrorie was sent off. Alfredo Morelos, who was sent off last weekend although his red card has been rescinded and reduced to a yellow, got his third goal of the season after some sloppy St Mirren defending and centre-back Connor Goldson struck with his first goal for the club to give Rangers a two goal advantage. "I've spoken to the team and praised them for the result," said Gerrard, whose side opened with a 1-1 draw with Aberdeen last weekend and are two points off leaders Hearts after two matches. "But I've also spoken about discipline and composure out there. "It's difficult enough with 11 men. We're picking up too many red and yellow cards for my liking. But we'll learn, grow and keep going." Goldson went close to making it 3-0 as his header hit the post. St Mirren had very little to offer although Danny Mullen, who has been in fine form with three to his name this term, hit the bar. Celtic manager Brendan Rodgers quashed suggestions he could walk away from the Scottish champions due to disagreements with the club's board over transfer spending despite falling to an early season 1-0 defeat at Hearts on Saturday. Rodgers has masterminded two consecutive domestic trebles since joining the Glasgow giants, but publicly voiced his frustration at not adding to his squad before a 1-1 draw at home to Greek champions AEK Athens in the Champions League third qualifying round in midweek. Northern Irish veteran Kyle Lafferty's fine strike from the edge of the box 11 minutes after half-time sent Craig Levein's men to the top of the table with maximum points from their opening two games. "Of course we want quality players but there's still improvement in this squad, this team, lots of young players so we'll continue to work with and improve them," said Rodgers. "I love my life here. Despite all reports, there's talk of ultimatums with the board, I don't work that way, my communication is very open, so that's certainly not the case."